Dr Tan grew up in Malaysia and arrived in Australia 1995 to study his final years of high school. He went on to study Dentistry at Adelaide University. 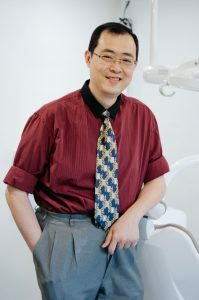 Following his graduation Dr Tan returned to Malaysia for three years to practice general dentistry. He then returned to Australia once again and moved to Queensland to study the specialty field of Orthodontics at the University of Queensland. On completion of this degree, he then established his own practice in Sunnybank where he has been practicing for more than ten years. Dr Tan is married to Wendy who is also a dentist. Wendy at times practices general dentistry from the Sunnybank practice but mainly works at the hospital for Queensland Health. They have 2 daughters Shania and Tiana. Dr Tan is an avid soccer fan supporting Chelsea in the English premier league and the Brisbane Lions of the AFL. Dr Tan often comments that the first reaction of the patient immediately after the removal of braces is one of the most gratifying experiences an orthodontist could have, often exclaiming “oh my God, I can’t stop smiling now” and ”I can’t believe it, I have a beautiful smile”. After finishing school, Jasyn studied a science degree before deciding to study Dentistry, completed it at UQ in 2007. Jasyn worked in Gladstone for two years before returning to private practice in a number of practices in and around Brisbane. In 2012, Jasyn returned to UQ to begin his postgraduate orthodontic study. Jasyn is a registered specialist in orthodontics, having completed a three year Doctorate of Clinical Dentistry (Orthodontics). He holds memberships and affiliations with the Australian Dental Association, Australian Society of Orthodontists, Australian Orthodontic Board and Royal Australasian College of Dental Surgeons. In his spare time, Jasyn enjoys attending Brisbane Broncos games, renovating his house and spending time with his wife. Justine aims to provide treatment options based on the best available scientific evidence and is comfortable using a number of different orthodontic appliances including functional appliances. Justine qualified as a dentist from the University of Otago, NZ in 1996. She worked as a general dentist in hospital practice, private practice and with the NZ Defence Force before heading overseas to the UK in 2000. There she worked in a number of family dental practices before settling into a specialist orthodontic practice as an orthodontic assistant. From that point on she knew what she wanted to do for the rest of her career and in 2006 she arrived in Brisbane to begin her postgraduate study at the University of Queensland. Justine is a Registered specialist in Orthodontics, having completed a Doctorate of Clinical Dentistry (Orthodontics) in 2008. She is a member of the Australian Society of Orthodontists and has undertaken further examinations to gain membership to the Royal Australasian College of Dental Surgeons and the Royal College of Surgeons of Edinburgh. Justine is married, and is mum to a busy toddler. Her interests include photography, reading and travel (though not as much as she’d like these days!). Tony was born in Taiwan and grew up in Christchurch, New Zealand. Tony has studied three years of physiotherapy before deciding that dentistry was his true passion. He graduated from University of Otago, New Zealand and can speak fluent English and Mandarin. As a dentist Tony has worked in both the public and private sectors, in regional and urban areas of both Queensland and New South Wales. On a regular basis, Tony treats patients under general anaesthetic in the local hospital. His professional expertise is in his gentle caring approach, and painless management of patients. Tony regularly attends postgraduate courses to ensure that he can provide the most up to date dental knowledge for his patients. Tony is a gentle, caring dentist who is committed to providing you, and your family with the highest quality dental treatment at Dream Smiles Orthodontics. Soo Jin was born in Korea and grew up in Auckland, New Zealand before making her first step into Queensland to become a dentist she was dreaming for since her early childhood. She has gentle, caring nature and speaks fluent English and Korean. Upon her graduation, she worked as a general dentist in private practices in Brisbane and Sydney before joining Dream Smiles Orthodontics. She enjoys all aspects of general dentistry, has a special interest in orthodontics and loves to sit down with her patients to give a holistic treatment with a great smile and genuine heart. Soo Jin enjoys travelling, playing golf and exploring local shops in her spare time.